“Claire and her best friend Patsy are as lovable as ever; even with all the new problems they face, they keep their sense of humor. The storyline is believable, and readers will identify with issues that are mentioned in the book. Mulligan writes with humor and wit. This book does not disappoint.” - Romantic Times, 4-Stars A homeless author, a heartbroken daughter, and a theatre ghost. There's trouble in Chapel Springs. 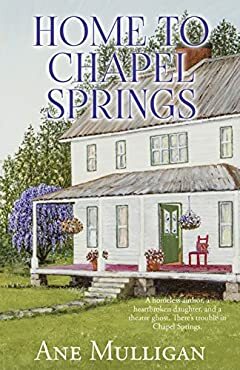 There's always someone new in Chapel Springs—someone who is either coming home or stirring up trouble. A best-selling author's latest book is a flop. While the reviewers are happily skewering her, Claire’s racecar-driver-husband walks out on her. Evicted because he hasn't paid the lease on their condo in months, Claire discovers the no-count-jerk also he drained their bank accounts. Homeless and broke, she and her little boy have no choice but to retreat to the house she inherited from her nana in Chapel Springs—the house that's been gutted. Then, a stranger knocks on her door. One that will change the course of her life. Claire's youngest daughter is in love with a non-believer whose daddy is Claire's nemesis, the mayor. Having him part of her family isn't in her plan. The years of heartache before her husband became a Christian should warn her daughter off this boy. So far, her daughter's heart isn't hearing the warnings. With hearts pulled in all directions, will they find a home in Chapel Springs?